Kronshtadt has two tall rear range lights and this is, at 95 feet is the shorter of the two. 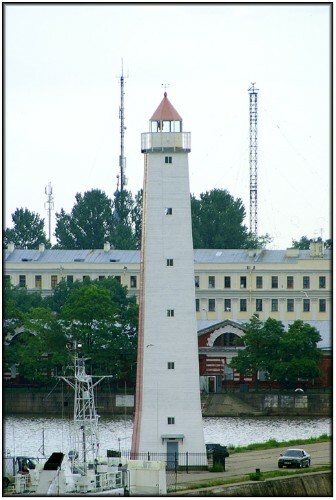 It is located on the Petrovskaya Pristan, one of the main breakwaters within the harbour at the Kronshtadt naval base. The front range light is located outside the harbour and, unfortunately, I was unable to get a shot of it on occasion. The Lighthouse Directory describes this light as having one side painted red, with a black vertical stripe indicating the range line. The red seems to have faded a little but it can just be made out on the left side of the tower in this photo.